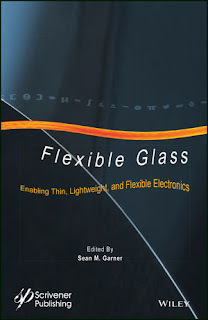 You can download Flexible Glass Enabling Thin, Lightweight, and Flexible Electronics by Sean M. Garner free in pdf format. This book details flexible glass properties that enable use in emerging electronic and opto-electronic applications. Discussion includes flexible glass advantages compared to alternative substrate materials. Examples describe flexible glass in processes such as vacuum deposition, monolithic integration, printing, and roll-to-roll. Flexible glass demonstrations in emerging applications such as photovoltaics, flexible displays, and optical interconnects are also detailed. Discussion of flexible glass processing and mechanical reliability. Demonstration of flexible glass in roll-to-roll (R2R) fabrication processes. Flexible glass substrate examples in displays, sensors, and photovoltaics. Flexible glass ecosystem description for identification of new applications.